In February, 2018, I talked with Mark Mazullo, a music professor at Macalester College, about the "Shawnee, Ohio" project and its performance for the Liquid Music Series at Macalester in St. Paul, Minnesota. In the interview, Mazullo asked about inspirations, style, the value of art, and my process as a composer and artist. It was originally published by Liquid Music on February 21, 2018. "I’ve been a fan of the writer Wendell Berry for a long time, and I set out to make my musical projects in a similar manner to the way he talks about farming – on a human scale and with a stewardship and connection to the people and places around me." MM: Your piece, "Shawnee, Ohio," is about place, in both a geographical sense and a human sense. You have a family connection to this small town, and in your many visits there, you have been impressed with the way its residents, "bound together by a common heritage of booms and busts," have persevered and held each other up by keeping the town alive. There are many ways to tell this story. How does music, specifically, allow us to gain unique insight into it? Why is this a musical story? BH: I think an important reason is that music has been of great significance to people from this region: labor songs, ballads, old timey and country music, high school orchestras, records, and radio. The more research I did, the more examples I found of music being made and listened to, and I wanted to reflect this in the project. Although the region doesn’t have the same fame and recorded documentation as Kentucky, for example, there is a distinct character to the recordings from Ohio, which you can hear in archives such as the Anne Grimes Collection in the Library of Congress. 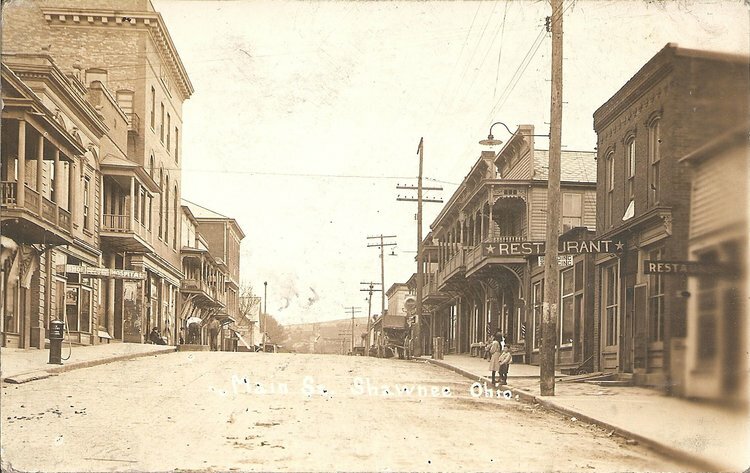 More personally, “Shawnee, Ohio” is also about my grandfather who grew up there at the beginning of the twentieth century, and the music he played and heard when he was young. Over the past seven years, I’ve been visiting Shawnee and nearby towns, asking myself again and again: “What do these places sound like?” and “What stories do these sounds tell?” I’ve been focusing on my ears as much as my eyes or other senses. The more I listened, the more stories jumped out at me from local residents and the forest itself. And, when I began working with archival recordings, there was singing right alongside storytelling. They are fused together, where the singing tells a story, and the talking becomes musical. When I hear residents talking, their speech becomes a kind of singing; I hear melody and rhythm, inflection and character – the grain of their voices –and setting music to go with them feels just like making songs. There’s an old folk tradition of passing down a familiar melody and switching out the words to fit local places and current events. Murder ballads are a great example. In fact there are two nineteenth century murder ballads in “Shawnee, Ohio,” telling gruesome stories from Gore, an appropriately named nearby town. It was a great way to pass along the news! I am tapping into this tradition throughout “Shawnee,” whether people are singing or speaking. The past mixes in with the present and tells a complex story of labor struggles, resistance, ecological damage, social life, and hope. Tell us something about your artistic inspirations in combining music with images and oral history. Have you always been interested in these connections, or was there a moment or particular experience in your life that drew you in this direction? When I was a young kid, I was always positioning myself near the adults at parties or weddings or funerals so I could listen to their conversations. Even without fully understanding what they were talking about, I could hear the cadences in their voices; and how a conversation would slowly evolve out of nothing, and would seem to go nowhere. My father still excels at this kind of conversation, languid and full of insight and quiet camaraderie. As a student, I loved the way my teacher, Michael Finnissy, incorporated all kinds of music from the past into his compositions, part of a tradition of musical borrowing going back to Charles Ives and beyond. I was also very much interested in Robert Ashley’s spoken operas, and Harry Partch’s use of vernacular language in pieces like “US Highball” or “The Letter.” But for me, the grain and scratch and hiss of recordings was just as important as the music itself. I transitioned into a hybrid between notation and sampling, drawing from DJs and remixers such as J Dilla and Madlib. Harry Smith’s Anthology of American Folk Music loomed large in my imagination, too: both the content and texture of individual recordings, and the fact that it was a huge idiosyncratic collection guided by Smith’s equally peculiar vision. Everything I’ve done since first listening to it has been, in one way or another, a response to it! But, I realized there was also great responsibility to sampling and music borrowing. Many ethical issues came up, and I became wary of indiscriminately using other people’s music, understanding that if done with privilege and power, it can become a damaging cultural appropriation. I started to work with specific sound archives over long periods of time, and interacting with the people and communities connected to the recordings. Other documents––including photos, maps, and letters––became important to me. Eventually, the projects became visual, too, and my approach to different media was the same: evoking the past to inform the present. I began to understand that I was not only performing my own music, but performing the whole archive like a giant instrument, and my contribution was just one small part among many. Your decisions in this piece around questions of musical style, instrumentation, and form are all clearly influenced by the Appalachian region. Did you have to learn anything new in order to compose this music? What were some of your challenges in writing it? I’m not a traditional musician, but I have been studying and listening closely to different kinds of Appalachian music for many years, mostly the old timey ballads and instrumental songs. This is music that predates bluegrass and tends to be slower, more sparse, and darker, all qualities that I like. I also relied on working with traditional musicians, like Anna Roberts-Gevalt on banjo, to find a spot between traditional and experimental music worlds. Listening, for me, is always the biggest (and most exciting) job for each project. I work with sound archives a lot, and the challenge here was that most of the recordings were not part of a formal collection, but were given to me from residents of Shawnee. This meant many hours of sifting through recordings, digitizing them from deteriorating cassette tapes, searching for clues and traces and sounds that resonate with me, and trying to understand the contexts around them. These recordings––of miners talking about their work and its dangers, a boy asking his grandmother questions about her past, murder ballads, and resistance songs––are at the heart of the piece, and once I understood how they would work next to one another, I composed everything around them. All of the instrumental parts are rooted in archival research too, in music that residents listened to. I incorporated into the score fragments of labor and popular songs, and even the music the Shawnee High School orchestra would have played in the 1920s. Another challenge was to reconcile my experimental background with the rural material. This meant determining exactly who the main audience would be, and I decided it should be the residents themselves. I ended up making a piece that contained my own personality and influences, but would also be familiar to the people in Shawnee. There are other examples of this, like the late period of the British composer Cornelius Cardew, where he was writing and playing music for local labor groups. I am, more and more, seeing the communities that I work with as co-authors of the music, where they are playing an active part in influencing how it gets made. This is done literally through the use of samples and remixing (where authorship is already in play), and more subtly with how interactions and friendships and the place itself might influence what material to choose and how the projects unfold. We struggle in our society to understand the value of things, like art, whose worth is not quantifiable. How do you talk about the value of art, specifically your own art, and especially in its relation to industrial, economic, and social forces that continually threaten its vitality? Are works like "Shawnee, Ohio" unique in their ability to speak across such lines? What about concert music that does not combine with words and images: is there a future for such art, and if so, what does it look like to you? I don’t think the projects I work on will be commercial successes, so you’re right; they are not quantifiable in terms of money! For me, value and meaning get mixed together; they grow slowly and are much harder to see. When I work with a community over a long period of time––in this case, people and places in and near Shawnee––I develop many different projects across media, including performances, recordings, essays, and installations, all part of a larger socially engaged art practice. So, the greatest value is in the relationships that are formed as a result of taking the time to listen to community members, and the residue of these interactions can find its way into the art that comes out of them. There is also value in creating projects that allow those voices and stories to be heard, of people often overlooked or marginalized. I guess I’ve had a strange relationship with concert music, and am often working outside the classical world. Partly by choice, partly by necessity: I knew it would be difficult to keep writing the same kind of music that I did when I was a student in London, for example. So, instead I let the landscape around me in Ohio influence how and what I wrote. I also promised myself that I would work on a small scale, independently, and with whatever and whoever was around me and willing. And now, I just can’t seem to separate the people and places and issues that I am passionate about and the music I am writing. It has all become part of the same thing. I’ve been a fan of the writer Wendell Berry for a long time, and I set out to make my musical projects in a similar manner to the way he talks about farming – on a human scale and with a stewardship and connection to the people and places around me. This turned out to be critically important: I was no longer writing based on instrumentation or in a particular style. I now wrote for what was necessary to make a project work, and with people I trusted to take risks with. So, there is value in that, too. And yes, there is absolutely plenty of room for music that doesn’t combine words and images! I’ve just widened my search to find it in many different – and often rural – places, in addition to the concert hall and urban cultural centers. I can hear that vitality in sound archives, or in the communal listening practices of Pauline Oliveros; I can also hear it in a family playing music together in their living room, or in the scratch and warble of a recording of fiddle music from a century ago. Mark Mazullo is Professor of Music History and Piano at Macalester College in St. Paul, MN. A performer and writer, he is the author of the book, Shostakovich's Preludes and Fugues: contexts, style, performance (Yale University Press, 2010), as well as many articles and essays that have appeared in such journals as The Yale Review, Musical Quarterly, American Music, Popular Music, and others. As a pianist, he has a special affinity for Beethoven, and he is currently preparing the last five sonatas for performances at Macalester College and elsewhere in the 2018.19 season.